Some friends and I were talking on the weekend about the moment we first experienced pure happiness and actually knew it. We were all quite young – four, five or six years old – when we experienced the unencumbered joy of taking pleasure in the moment. I had a thing for windmills when I was a young child. When I was about four a new toy shop opened in the High Street. The window was decorated with all manner of wonderful things – baby dolls with their own prams, wind-up robots, the latest Barbie and Cindy dolls, roller skates; and most wondrous of all – bright and shiny windmills in a huge array of colours. The windmills (or pinwheels as some people call them) were sixpence. I had only thruppence in my Jolly Leprechaun money bank that my Irish cousins had given me for my birthday. I spent hours, days, devising plans to get the rest of the money, praying every night for thruppence. One day my Aunt Jo took me into town. We fed the ducks in the park, ate ice-creams, then happened to walk past the toy shop. Aunt Jo bought me a red and blue windmill. That afternoon I walked out into the garden, licking my finger and holding it up to the air, as I had seen my grandfather do before casting his line when fishing; testing for wind direction. Satisfied there was sufficient wind, I took out my prized windmill and walked around the garden. The low afternoon light brushed the edges of the red and blue foil, flinging the colours out into the hedgerows like mini laser lights. The wheels turned with a satisfying whirr, red and blue spirals soaring and zooming as the wind took hold. I marched round and round the garden as if I was on parade, holding my windmill aloft. A robin came. A hedgehog, wondering what all the fuss was about. I continued to march, shoulders held straight with pride. The garden, the hedgehog, the robin, the wind, the spin of the windmill, the almost amber afternoon light, my marching feet gliding on the lawn. This was enough to ensure my complete happiness. I hummed to myself, composing a rhapsody to the wind and spinning wheels, happier than I remembered ever being before. And the equation put in place that day has held true ever since. Simple things+ simple pleasures = pure happiness. Both my girlies got pinwheels just last week. They ran around the yard with them, then planted their stems in the ground by their swingset. They look like cheerful multicolored flowers, spinning and waving at the bumblebees. I love this and can really relate to it…I find that when I am able to live in the moment I find real joy and freedom! Yes I love pinwheels. I’ve this big silly grin across my face now. You write really well. I think in this lovely story that you’ve “nailed” the meaning and essence of happiness for all of us. So very true. It’s the simple pleasures and seemingly insignificant moments that endure and endear us to people and treasures. Well done Sel! (as usual). Wonderfully visual – where you painted in pastels yesterday, today it’s bright vivid colors! I still keep several pinwheels ‘planted’ in the ground through the summer – visual happiness. I remember the joy of windmills! They are great! As you said simple things equal simple pleasure. It is amazing how far we often stray from the joys of life! Thanks for sharing this memory and lesson. I love to have pinwheels in the garden. You can’t help but feel cheery when you see them. I’m going to go and try to find one to put in the garden today! I completely agree. That philosophy really helps with things like depression too. Living in the moment, if it can be mastered, is really the way to go. Thanks so much for stopping by. Oh, poor Mitz. I hope she is better now. I love your cats! I enjoyed those moments as a kid too. I am so pleased to be writing vividly today. It’s funny how the colours of the words change from day to day! It really is visual happiness. What a perfect way to describe it! It was fun to remember. i think we can learn a lot from kids and from childhood memories! What a memory you have. I can’t remember the first time I felt pure happiness but I can remember the last time, it was when that hedgehog appeared wondering what all the fuss about. Beautiful. Simple things+ simple pleasures = pure happiness–So, so true but so, so easy to forget. I spent the weekend working on my apartment’s blah beige small porch. My back aches today but the sight of clean furniture and planters full of bright flowers makes me happier than I’ve been in months. And a shiny windmill would be the finishing touch-thanks, Selma! Oh, now you’re making me teary. You are so kind to me. What a lovely thing to say! I am absolutely delighted to hear from you. Hope you’ve been well. I know exactly what you mean about how cleaning up an area can lift your spirits. It is amazing how flowers can lighten your mood, isn’t it? Hope you find a nice little windmill to add the finishing touch! I had a big one that I bought at a stall at an agricultural show fixed to my garden shed for many years, so it’s not only children who like windmills. Unfortunately, it got carried away in a storm one night, but I still have my wind-chimes … and I keep an eye out for a similar windmill. The simple things in life are often the best….this is my credo and always has been. One of my greatest joys is just being outside on a sunny mild day with my hands in the soil, preparing to help something grow. That is my bliss. 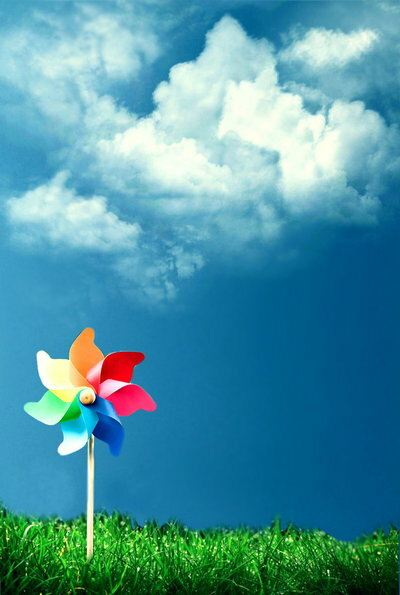 I must admit that even now I love windmills and things like weather vanes. Anything that spins round and round in the wind will do. I hope you find a replacement windmill one day! Totally with you on being in the garden doing a spot of planting. There is nothing like it. It centres me and makes me smile. Nature’s own Prozac! if only life was so simple…..
how true how sometimes it is the simplest things that bring us the greatest pleasure! I just have to look at Mica and smile! “Some friends and I were talking on the weekend about the moment we first experienced pure happiness and actually knew it”. Hi Selma, the way I see it, pure things are things that are unadulterated. Pure water is nothing but water. Pure happiness is nothing but happiness. Once we knows we are happy then our happiness has been contaminated with knowledge (thought, reflection, consciousness) and our happiness is no longer pure. I reckon the last time we are purely happy is when we cannot know we are happy, i.e. before we learn language. From then on, our happiness is impure because it is mixed with knowledge (etc)-which is not necessarily a bad thing because although knowledge contaminates our happiness, it also allows us to remember states of happiness from the past. Some childhood memories really are the best! Wouldn’t it be nice if we could apply such an equation to everything? Mica would make the hardest of hearts melt. It gives me pleasure just thinking about her! You are right. I guess that holds true for many things. Put wisdom and experience into the mix and things are not as pure as they once were. However, I still think that it is possible as an adult to experience something that is ‘pure’ in essence. Not as easy to recognise, but I still think it occurs!! Windmills have always enchanted me as well. If there wasn’t enough wind, we’d race around the yard, making the plastic clatter and spin into a blur of color. Sometimes we’d just stand in one spot and spin until the entire world was as blurry as the pinwheels we held. Yeah, bliss. Great post, Selma. Thanks for the wonderful memories. I used to spin round and round too until the entire world was blurry. What fun we used to have. I can’t spin like that any more – I get motion sickness and my knees give out. LOL.